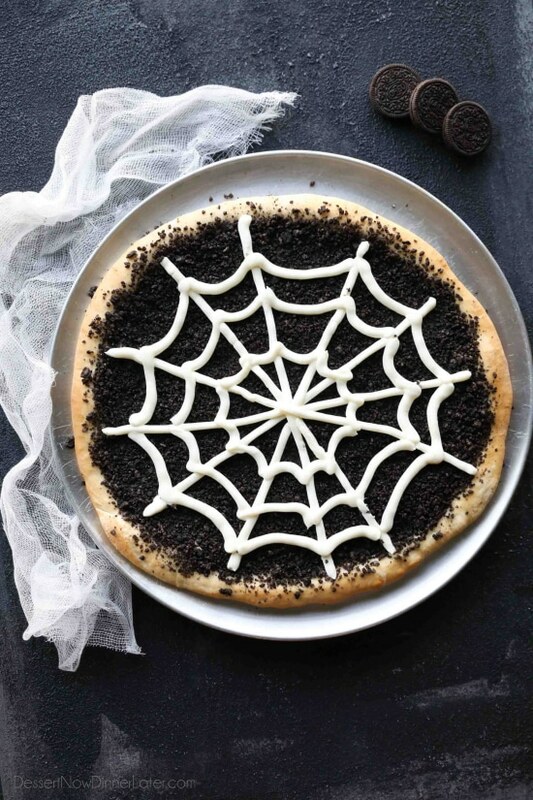 Cobweb Oreo Dessert Pizza - Dessert Now, Dinner Later! There’s an all-you-can-eat pizza place in our town called Pizza Pie Café that serves all kinds of pizza, including dessert pizzas. And they aren’t just cookie dessert pizzas, they are made with pizza dough. 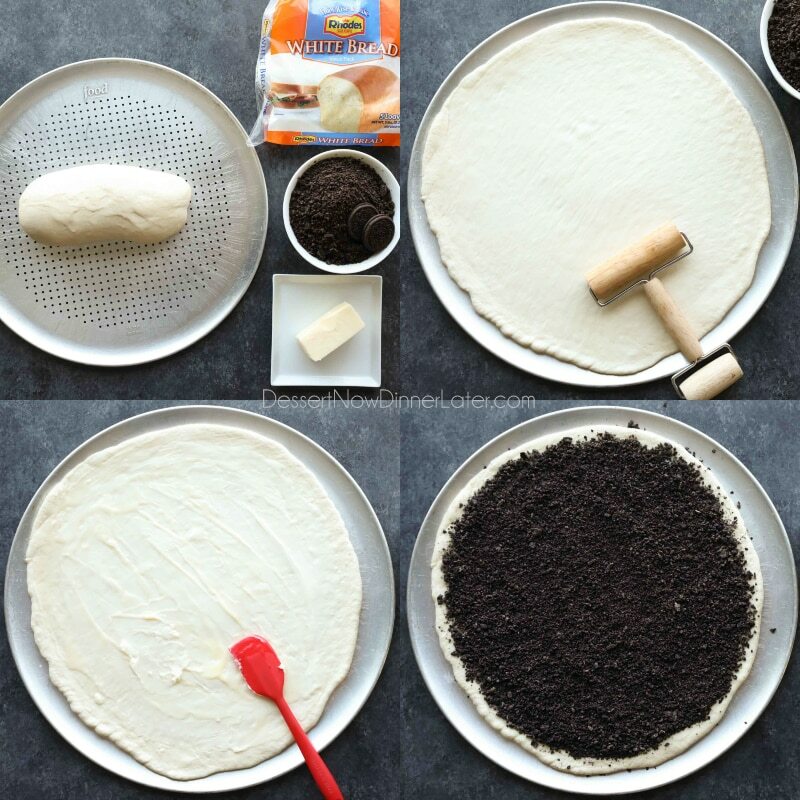 My absolute favorite, is the Oreo dessert pizza. Normally the Oreo dessert pizza at Pizza Pie Café has cream cheese icing and a caramel sauce drizzled over the top. 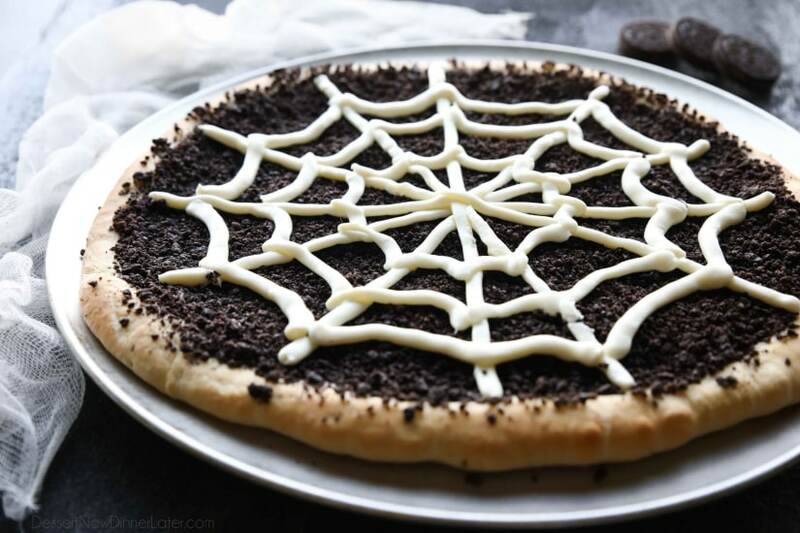 I thought I would make a fun Halloween-themed Oreo dessert pizza with a stiffer frosting for a cobweb design. 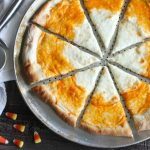 It turned out awesome and would be a great dessert paired with my savory Candy Corn Pizza. 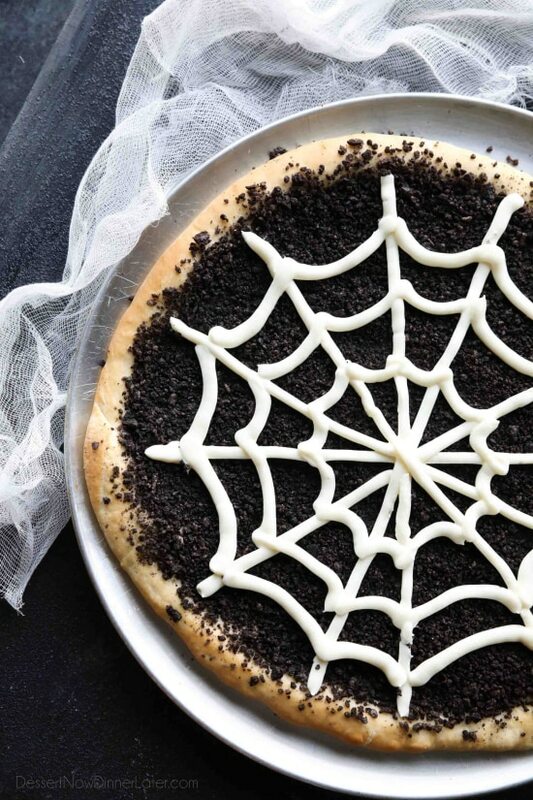 This cobweb Oreo dessert pizza couldn’t be easier to make because it starts with Rhodes frozen dough. I use Rhodes bread every time we make homemade pizza. It’s so fresh tasting and easy to work with. 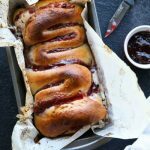 Thaw a loaf of Rhodes White Bread and roll it out onto a greased pizza pan. Spread softened butter on top. Sprinkle with crushed Oreos and bake! 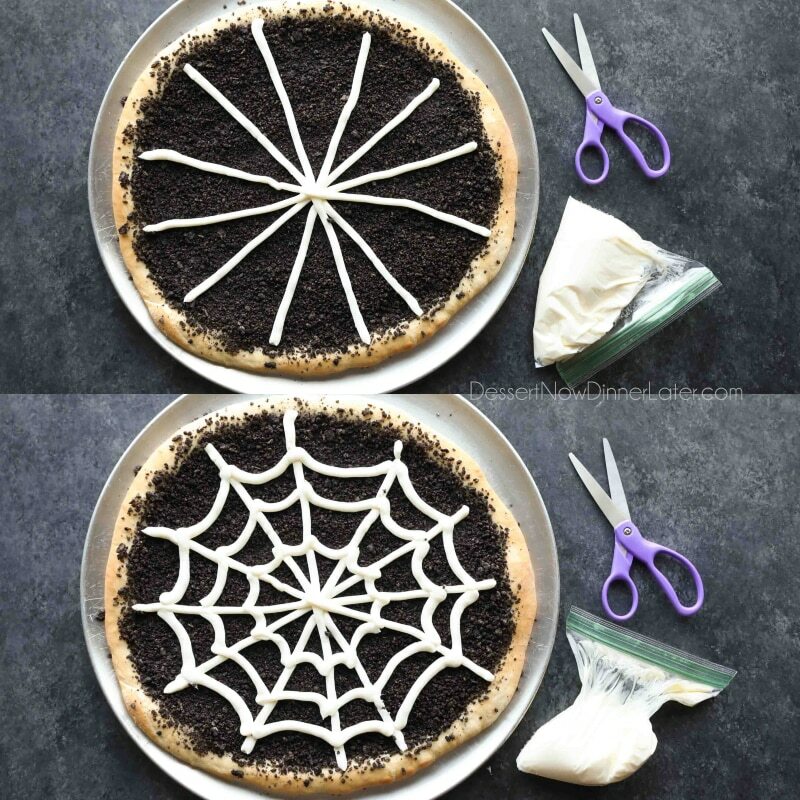 This Oreo dessert pizza is most delicious served warm, but be sure to cool it enough that the frosting doesn’t melt and ruin your design. 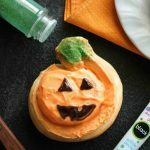 The best part about this Halloween party dessert is that it’s just the right amount of sweet without being over-indulgent. So you can still have some Halloween candy later on. 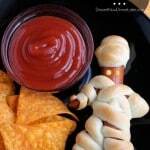 Use a rolling pin to roll the dough into a circle the size of the pizza pan. Spread softened butter on top. Use a food processor or blender to crush Oreo cookies into fine crumbs. Sprinkle the crumbs over the butter and use your hand to flatten/adhere the crumbs to the butter. Preheat oven and bake at 425 degrees Fahrenheit for 16-18 minutes. Until crust is brown on the edges and on the bottom. Cool to room temperature. In a large bowl with a hand mixer, beat the cream cheese and butter until smooth. Add the powdered sugar, vanilla, and milk. Blend together. Fill a sandwich bag with the frosting. Cut off a small corner of the bag with scissors. Use a pizza cutter to slice pizza into 16 pieces. Serve immediately. Can keep leftovers covered at room temperature. 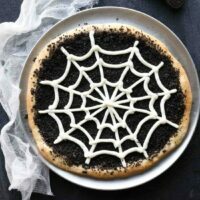 *Oreo pizza can be made ahead of time, but I would recommend frosting the cobweb just before serving. The frosting has the best texture/consistency at room temperature.